Mexican Crucillo is a member of the Buckthorn Family. It takes the form of a woody shrub and grows to 5 feet in height. It has dark green, spatula-shaped leaves which grow on alternate sides of the stem to 3/16 inches in length. The plant grows in sandy or gravelly areas on slopes and on mesas at elevations between 2500-4500 feet. 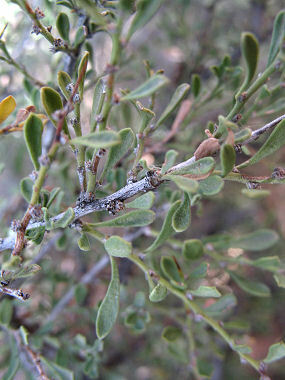 Mexican Crucillo gets its common name from the fact that it has thorn tipped branches. Mexican Crucillo blooms in the spring and produces tiny flowers with no petals which grow alone or in clusters. Flowers are followed by a round, dark red berry to 0.25 inches in diameter.